I’ve gotten mails asking why the COMMENTS, SUBSCRIPTION and SEARCH icons no longer work. They are being worked on, and should be back as soon as I get them right. Meanwhile, here’s a little post for Sunday since you are already here and as a [sort of] apology for the continued blips! Before we exit Emotan Magazine stories for a while, here’s somebody from Vol. 2 No.3 fast forward, or s-l-o-w forward over thirty-two years. “ Louanne (Jide-) Smith, The Story of a Transplanted American” graced our “Our Kind of People” page back in March/April 1979! “In almost ten years that I first met Louanne Smith (then Miss Finkel), she hasn’t changed a bit. She’s still as vivacious, personable and outgoing as ever. Physically, too, she hasn’t changed a bit – may be not exactly because when we had this interview at her home in Kaduna in March, she was expecting a baby. For Louanne, though, that long period, no matter how short it seems to me, has been many years of action.” Well, over 40 years since that first meeting, Louanne remains even more VIVACIOUS. Readers will have to wait for an appropriate time for the full story. Suffice to mention, though, that Louanne and I had met at Florida in 1970 and before then, she had answered JFK’s call to America’s youth to “ask not what [their] country can do … but what [they] can do for [their] country…”, and headed to Aiyepe in present Ogun State where she taught at Ansar-U-Deen Girls’ School as a Peace Corps member. She’s been married to retired Dr. Jide Smith who’s a retired Nigerian army medical doctor. The interview was the last time we saw but we caught up with each other – or, to borrow a term used by a younger friend – I got her “coordinates” through the web last Christmas but we actually had a reunion yesterday somewhere on the eastern seaboard of the USA. A good old-fashioned Nigerian reunion at the train station: think THAT re-union drawing from Peter [Pan] Enahoro’s How to be a Nigerian. 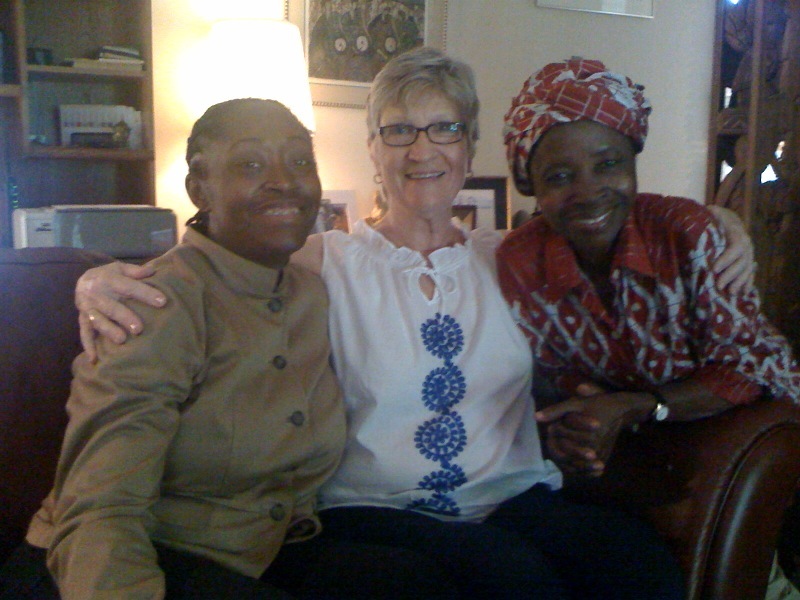 With Louanne & me in the picture above [taken yesterday, July 9, 2011] on the left is Gbemi, for whom Louanne & her mother (now 91), were the nearest “relations” apart from my husband back in 1970. And she was NOT married to a Nigerian back then!